For most of human history, we effortlessly consumed (nose-to-tail) the things we needed for strength, health and happiness. Like the fertile ground that we once walked upon, we were a natural extension of this earth. In the modern world, we unknowingly struggle to fulfill our nutritional needs in order to support and sustain a vibrant, disease-free life. We are now part of a world where individuals struggle with kidney health, urinary maladies, detoxification and histamine intolerance. The solution is to restore and rebuild our biological resilience with proven anthropological ways that are backed by modern science... this includes the use of kidney glandular. Organs and glandulars were a staple of our early ancestors' diets as the ultimate superfood, for good reason. It turns out, this nourishing tradition is backed by science... "Radioisotope labeling studies in animals have shown conclusively that, when eaten, organs and glands selectively travel to the corresponding organs and glands in high concentrations. This research, done at the University of Scotland in Edinburgh, lends credence to the ancient practice of eating animal organs to help ensure health in one’s corresponding organs..." - Dr. Ron Schmid, ND. *4 Our early ancestors knew this, which is why their traditional diets included the frequent and nourishing consumption of nose-to-tail nutrients. 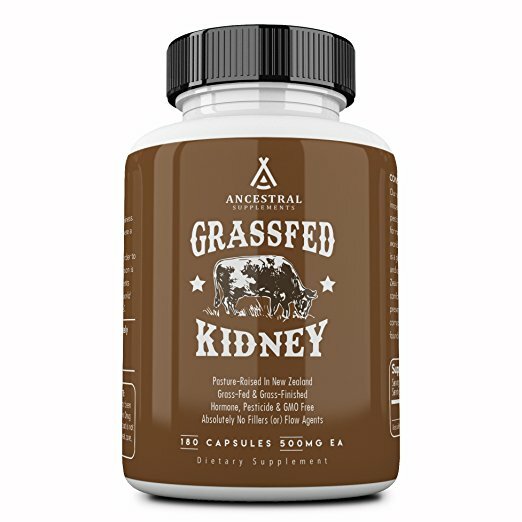 Our Grass Fed Kidney is a whole food dietary supplement that provides 100% bovine kidney. This supplement can be taken with (or) without food (even though it technically is food). The suggested use is 6 capsules a day or as directed by a healthcare professional — for added support, the dose can be doubled. If consuming more than six capsules at once, the doses should be separated by at least three hours to improve tolerability. Take 10 minutes before histamine-rich foods. Suggested use is 1-3 capsules per meal or as directed by a healthcare professional. Start with just 1 capsule; slowly work up to therapeutic dose (see "Potential Issues" below). NOTE: Diamine oxidate (DAO) is not an animal class nor species exclusive enzyme. In other words, DAO is not exclusive to porcine kidney nor green pea sprouts nor human placenta. In mammals, histamine can be inactivated either by methylation of the imidazole ring nitrogen, catalysed by histamine N-methyltransferase or by oxidative deamination of the primary amino group, catalysed by DAO. For these reasons, certain glands such as Kidney, Thymus, Intestines (probably placenta) that support methylation (w/ endogenous methyl groups, B12, folate, selenium, etc) and contain the DAO enzyme should be considered to support histamine health. Additionally, many legumes (lentils, beans, peas, etc) produce diamine oxidase (DAO) too as the seed germinates to form a seedling. Take with (or) without food. Suggested use is 6 capsules a day in divided doses or as directed by a healthcare professional. Start with just 1 capsule; slowly work up to six capsules a day (see "Potential Issues" below)... dosing should be separated by at least three hours to improve tolerability. A detoxification reaction is more likely to occur when starting with the full suggested serving size of 6 capsules per day. If you know that you are sensitive to supplements and/or you have an autoimmune condition, you may wish to start slow when adding this product to your current regimen. Tolerability can be greatly improved by starting with just 1 (or) 2 capsules a day and increasing by just 1 capsule every couple of days — this method may take a full two weeks to achieve the desired serving size of 6 capsules per day. For customers that are highly sensitive to supplements and/or have an autoimmune and/or methylation SNPs, I suggest that you "play it safe" by introducing just one new capsule per week. In other words, just 1 capsule during the 1st week... 2 capsules during the 2nd week... 3 capsules during the 3rd week and so on... yes, this will take some time to reach the suggested dosages but this greatly helps to ensure tolerability of this deep nourishment so that it has a chance to do good. Many kidney issues have either a hyperinsulinemic characteristic, an autoimmune characteristic, and or a combination of autoimmunity or hyperinsulinism. I'm not saying that all do, just most! A standard, low-ish carb paleo/primal diet can fix most of these issues. For serious kidney damage a low-protein, ketogenic diet can be remarkably therapeutic (see below). Restrict protein to just what your body needs. An ideal protein intake for most is 40 to 70 grams a day (The AKF recommends a maximum of 50 grams). Restrict or eliminate carbs... chronically elevated BLOOD GLUCOSE levels DO cause kidney damage. Restrict or eliminate fruits and all fructose. Dietary fructose REALLY causes kidney damage. Restrict liquids to pure, clean water... stop the sugar madness and drink what our early ancestors drank! If you get kidney stones that are from oxalates, reduce your green veggie intake (spinach for example) and have other types of veggies. If you get kidney stones that are from urate salts, you are likely NOT following a low-ish carb paleo diet, you likely have insulin resistance and your liver is not processing uric acid. Ketosis is a high fat, moderate protein, low carbohydrate way of eating. For serious kidney damage, consider going with a higher fat, lower protein and low carbs approach. Have a look at what I eat but be careful with too much protein as this can kick you out of ketosis and add stress to your kidneys. TYPICAL KETO — FOR ME... 75% healthy fats, 20% protein and 5% carbohydrates. TYPICAL KETO — FOR KIDNEY RECOVERY... 85% healthy fats, 10% protein and 5% carbohydrates. NOW Brand MCT oil (1-2 tablespoons; up to 30g- dose to tolerability). NOTE: MCT always produces elevated ketones. This shake takes me a whopping 15 minutes to make... It's super convenient... and, it's down right delicious. If I don't make a shake, I will have a bunch of pasture-raised eggs (8 or so - for kidney recovery, adjust this down by 2/3) that are smothered in a massive amount of butter topped with crunchy sea salt, a side of avocado, nitrate-free, sugar-free bacon and a dollop of homemade sour cream. Are you kidding me... don't even try to tell me that your current breakfast is better in taste nor in health. We generally carb reload on the weekends with plenty of sweet potatoes, raw local honey, the occasional sorghum and various in-season fruits. For kidney health, I don't suggest massive refeeds like we do... stay the course until you're better. We also do a twenty-four to thirty hour fast on Sundays... it's not as bad as it sounds. We eat an early dinner as we normally would on early Saturday evening... skip our first meal on Sunday, and eat an amazing fish-based dinner (usually wild caught sardines) with the entire tribe on Sunday. Once a quarter, we do a 5-day water only fast (adults only). For kidney health, check with your doctor first... stage 3 and 4 patients may have more difficulties maintaining fluid. Magnesium... transdermal magnesium oil applied to feet before bed and oral magnesium. Honorable Mentions For Targeted Support - may use Thymus or Spleen for allergies or to boost immune system... Kidney for kidney and urinary support... Brain if the brain need a boost... Bovine Tracheal Cartilage to recover an injury... Thyroid in the winter when little to no carbs are available... Adrenal if adrenal support is required... you get the picture. Keep in mind that my tribe and I eat a very nutrient dense diet. We consume the whole animal just as our ancestors did... That's right, we eat the liver, kidney, pancreas, spleen, heart, thymus, bones, tendons, ligaments and more... and we eat this way every day (except on vacation we take extra Liver, Beef Organs and Bone Marrow supplements). We love our bone broth (this is my wife's specialty), and we eat tons of pastured eggs. Wife is awesome enough to sprout chickpeas for us. Then, she turns half of the batch into the best homemade hummus in the world. Super high in folate (NOT SYNTHETIC FOLIC ACID, big diff)!! You never know, ancestral eating patterns (i.e. cycling back and forth between paleo, ketosis and fasting) could easily be the missing link to the energy, mood, memory and mental performance benefits that we are all after. This is how our early ancestors ate. Start eating like this to build your biological resilience. If you'd like to know exactly how my tribe and I live to support optimal health, go to our "About Us" page and read the entire page. Okay, you're convinced! You're going to start incorporating nose-to-tail nourishment in your routine because, well... you're educated now... you understand, just as our early ancestors did, that they provide superlative health benefits that are missing in our modern diets. The next step is sourcing it. It's important that you source the highest quality because not all organs, glands and cartilage are created equal. Consider the source. If you're going to pick just one ancestral supplement to start with, make it our GRASS FED BEEF LIVER... unless you need targeted support with another specific organ system (see below). 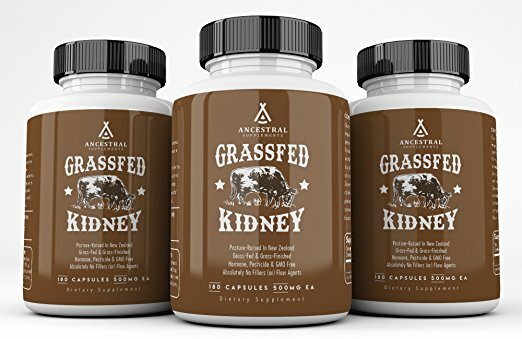 If you are going to pick two supplements, our GRASS FED BEEF LIVER and our GRASS FED BEEF ORGANS provide complementary and synergistic nourishment. If you can add a third supplement, GRASS FED BONE MARROW fills fat soluble nutrition gaps, provides stem cells, bovine cartilage, glycosaminoglycans and the fat soluble activators that nutrition giant Dr. Weston Price extensively wrote about. Not all organs and glands are the same. Look for the highest quality bovine kidney... It should come from pasture-raised, grass-fed and grass-finished animals that are hormone, pesticide and GMO free. If considering a supplement, look for one that is ultra pure (without binders, fillers (or) flow agents) and look for the freeze dried variety as these have been shown to optimally preserve nutritional factors, growth factors and co-factors. We care deeply about each and every aspect of our "seed to supplement" way of life... great love and gratitude goes out to the souls of these beautiful creatures that were sacrificed so that we could be nourished.